Richard Dominick Incognito Jr. was born July 5, 1983 in Englewood and spent his early years in Union City and Bogota. Richie was always too big to play with boys his age, and not always equipped emotionally to play with boys 3 and 4 years older. Richie was tough on himself when he failed, but not as tough as the kids who called him Fatso. Richie senior, who often coached his son, could be just as intense. A tile-setter, he was all about focus, precision and getting it right. Richie Sr. believed his son’s future was in baseball, so the family moved to the Phoenix area when Richie was coming up on his teen years. As he continued to grow, however, it became clear that football would be his ticket to bigger and better things. Richie was big, smart and quick, a talented two-way lineman who became a star for Mountain Ridge High School in Glendale. He anchored the Mountain Lions’ offensive line and was a finalist for Arizona’s Player of the Year as a senior in 2000. His teammates loved his fire and passion; opponents hated how he always crossed the line between aggressive and dirty play. Richie stood 6’3” and was nearly 300 pounds. He was heavily recruited by several schools, and eventually accepted a scholarship from the University of Nebraska. He red-shirted the 2001 season, working out with the team and learning the playbook. It became clear right away that Richie was a complete, whistle-to-whistle type player who probably could have started for the Cornhuskers as an 18-year-old. In 2002, he did step into the starting lineup at left tackle, becoming the first freshman lineman to start an opener for coach Frank Solich. The Cornhuskers had an up-and-down season, finishing 7–7 after an Independence Bowl loss to Ole Miss. Richie was recognized as a freshman All-American and made the freshman All-Big 12 team. He also gained a reputation as a player willing to pick a fight or commit personal fouls. One penalty, against Colorado, cost Nebraska a win. The following spring, Richie got into a fight in practice. He was suspended by Coach Solich and sent to an anger management program. Richie’s behavior improved and he had a great 2003 season, earning First-Team All-Big 12 honors. In 2004, new coach Bill Callahan moved Richie to center. He’d played the position in high school, so the transition should not have been difficult. However, he got into a fight in the locker room and withdrew from school soon after. It seemed for a time that Richie would transfer to Oregon, but coach Mike Bellotti had second thoughts and refused to take him. In 2005, Richie decided to enter the NFL Draft. He was selected by the St. Louis Rams in the third round. After riding the bench as a rookie, Richie did a great job playing three different position for St. Louis in 2006. The Rams started and finished strong, but lost 7 of 9 games in the middle to finish 6–10. Marc Bulger topped 4,000 passing yards and Steven Jacksin led the NFL in yards from scrimmage. Richie got plenty of credit for those numbers. After missing much of 2007 to a knee injury, Richie returned to the field and had another good year in 2008. However, in 2009, his dirty play got him in coach Steve Spagnuolo’s doghouse and the Rams released him late in the season. He finished the year with the Buffalo Bills, who claimed him off waivers. After the season, a poll of NFL players named Richie football’s dirtiest payer. Within his own locker room, Richie was known as a guy who respected people who stood up to them, but would zero in on people he perceived as being weak. The 2010 season found Richie in a Miami Dolphins uniform. He played guard and center had had an excellent year. He was a big reason the team won 6 of its final 9 games after a dreadful start. He was even better in 2011, allowing just 1.5 sacks in 15 starts. Richie had his best year as a pro in 2012, earning his first Pro Bowl invitation. However, his off-field behavior was getting more and more out of control. 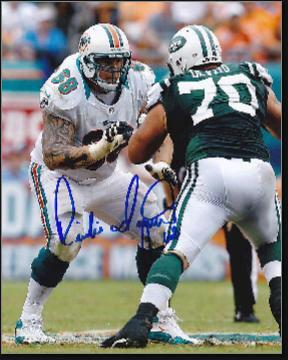 In 2013, the Dolphins suspended Richie after teammate Jonathan Martin complained that the veteran was bullying him. Incognito claimed that the team’s coaches had asked him to toughen Martin up, and that the two were actually friends. With Martin taking a sabbatical and Richie off the roster, the offensive line imploded; Ryan Tannehill was sacked 58 times—the most of any NFL quarterback. A league investigation completed in 2014 found that Richie and several teammates did harass Martin. It is hard to imagine the league banning a player for bullying, as this midset is uncomfortably close to the mental intimidation coaches try to foster in their players. Barring an inury, Richie was expected to be lining up for some NFL front five in 2014. However, as the season wore on, he remained a free agent, on the outisde looking in, and did not see any action. Richie made it back to the gridiron in 2015 with his old team, the Bills. Almost from the start, he distinguished himself as one of the top guards in the AFC. The Dolphins, on the other hand, were still looking for an adequate replacement. Richie was on his best behavior all season, the Bills went 8–8, and he was named as a Pro Bowl alternate.